Water Installations offers clients a range of services, including the purchase, delivery and installation of rainwater tanks. We also make steel tanks to suit your requirements. 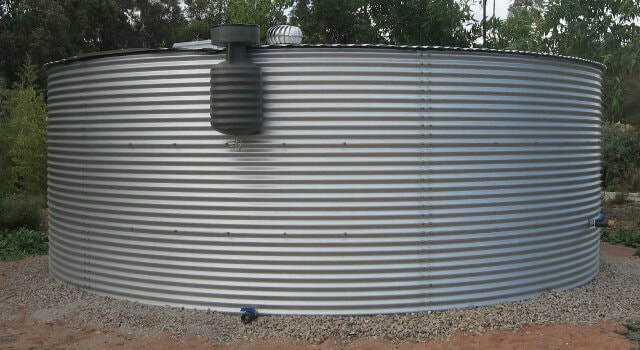 A complete range of tanks are available and some types include, polyethylene tanks, Steel Liner, Aquaplate in Galvanised & Colorbond colour tanks. Steel Liner tanks available with a capacity of up to 320,000 Litres. Our Rainwater tanks up to 20,000L are made from AQUAPLATE® steel and can be custom made to suit your needs. Aquaplate steel is a long lasting material, 1.5 times thicker than roofing steel and available in galvanised or a select range of colorbond colours. The interior surface is coated with a food-grade polymer lining to provide a clean-tasting source of water. Fire and UV resistant - Rainwater Tanks made with this material are best to withstand a bushfire! Easy maintenance, corrosion resistant tanks. Tank bases are laminated on both sides to provide superior corrosion resistance. Water Installations can assist with ALL aspects of your rainwater tank installation or simply supply you with a fabulous rainwater tank. 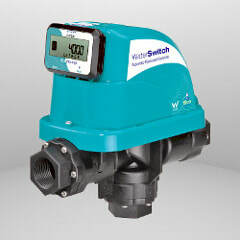 Full installation is subject to an on-site consultation, and depending on your requirements, whole house supply, irrigation to gardens, is inclusive of a pump, water switching device/Acqua Saver, UV filter, electrician, plumber, first flush and leaf eater. We perform simpler installations also, to connect your tank to existing storm water pipe and gutters. We sell all tank accessories in our shop to assist you with your DIY Rainwater Tank project. Of course, depending on the rainwater tank accessories of your choice, it can be reasonably straighforward to DIY, or you may require some assistance from us. We are happy to come out to your property and assist, labour is $96 p/hr plus travel, per subcontractor. 20 year BlueScope warranty and 3 year Water Installations Pty Ltd workmanship warranty. Base preparations - Concrete slab for each rainwater tank should be reinforced and 100mm thick. Damage caused by the customer not complying with base/pad recommendations will void any warranty. Steel Liner tanks are our larger Rainwater Tanks, ranging from 30,000 to 320,000 Litres. As we use custom orb sheeting for the walls and roof, you can choose almost any colour to match your residence, commercial building, fence or garage. Not only will you get a great looking tank, you will have a choice of two liners. There are also optional extras such as geotextile on the base to protect the liner, insect\vermin proofing and additional outlets. Steel Liner tanks come standard with 1 x 90mm overflow (100mm optional), leaf strainer, manhole, 1 x 50mm Camlock fitting, 1 x 50mm Gate Valve for fire fighting and 1 x 50mm Pump outlet for every tank we build. 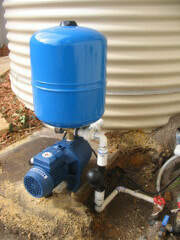 ​We can do all aspects of your rainwater tank installation. We can prepare the application and plans for Council, supply and compact the sand pad, install the tank with fittings where you want them, hook up the stormwater pipe and fittings from the building to the tank with overflows, flush valves, first flush devices and so on, connect pumps and filters, and use our plumbers and electricians to supply your house fixtures as required. Full installation is subject to an on-site consultation. You can install any size of rainwater tank. Most people want to use the rainwater - either for drinking or to flush toilets or to wash clothes. Water Installations mainly installs tanks which enable the household to use the water in the house usually for the kitchen, bathroom, toilet and/or laundry. 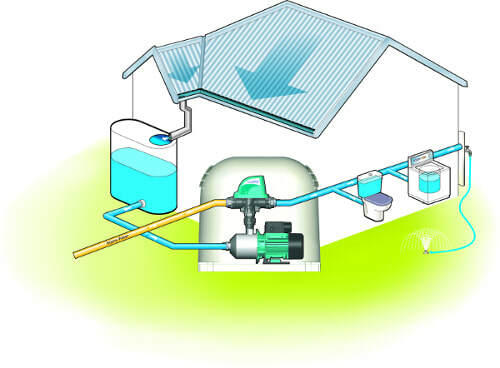 A pressure-tank pump is used to supply rainwater when required. When the tap is turned on, or the toilet flushes, the pump is activated and gently pumps water to fill the cistern, or enter the kitchen sink or washing machine. The tank on top of the pump permits water to be pumped under pressure. Instead of the pump turning on every time the tap is opened, the pressure inside the cylinder may be enough to supply the water to the house fixture. 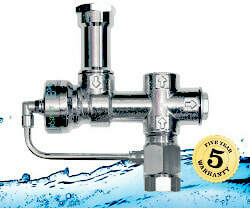 The pressure-tank pump system is only one of many ways to supply the household. GRS provides advice on a number of different types of pumps, as each has particular applications. What happens when I run out of rainwater? If you only install a small tank (e.g. less than 20 000 L) then it is likely you will run out of rainwater during the summer period. This, of course, depends on the uses of the rainwater. Providing a full laundry, kitchen and bathroom service rapidly depletes the volume you can collect during rainy times. GRS integrates the mains (scheme) water source with the rainwater source. 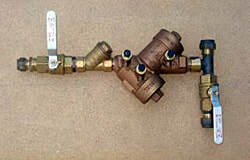 Generally, a double check valve is connected to both, and when the rainwater is depleted, you simply turn a couple of ball valves to enable mains water to enter the system. The double check valve is the minimum requirement recommended by the Water Corporation to prevent any cross-contamination of mains water and rainwater. A minimum fee of $275 is charged for the preparation of scale drawings and a written submission to a local council for a rainwater tank system. This fee includes a site visit where measurements of block size, house and other buildings size and location, distance to boundaries, and position of tank, and overflow to subsurface trenches and/or garden beds for drippers are taken. It is very helpful if you can supply a plan of the house and block showing dimensions and other details. Should you require both a rainwater tank and a greywater system, the fee is greatly reduced. However, the installation of a rainwater tank usually requires ‘building’ approval, while a greywater system needs ‘environmental health’ approval. Essentially, two different applications have to be written, although the same house and block plan can be used. The written submission nominally lists the specifications for the proposed system and brief notes about the system relevant to the application. Often, local government councils require engineered drawings from the tank manufacturer, and these are supplied as part of the submission to council. A Building License is issued for the successful application for a rainwater tank. For any greywater application, the completion of the “Application to Construct or Install an Apparatus for the Treatment of Sewage” form is provided. In both cases, these applications are either forwarded to the property owner so that they can submit this to their local council or are submitted to council on your behalf. Any application fees are the responsibility of the property owner, and these must be paid before any approvals are given. Every rainwater tank comes supplied with a basket (leaf) filter, tap (usually brass) and overflow pipe. Each tank manufacturer has their own fittings, but generally the basket filter is made from moulded plastic, the tap is either a simple stopcock or a gate valve, and the overflow pipe is a length of PVC which directs overflow to the ground. Filter bag – a 20 μm cloth filter which removes most sand and dust as the water enters the tank. Venting. Condensation is common is rainwater tanks. This is not a problem for poly (plastic) tanks but can cause minor corrosion in steel and steel-liner tanks. A ‘whirlybird’ vent or similar is installed in the tank lid to duct excess water vapour to the atmosphere. Dripperline can be supplied or installed to enable excess overflow from a full rainwater tank to be used to water garden areas.